Graffiti is not making things easy, even for those who are born with talent images. Like many other art forms, no one can was done without a lot of exercise. The easiest way is to create graffiti sketches first. 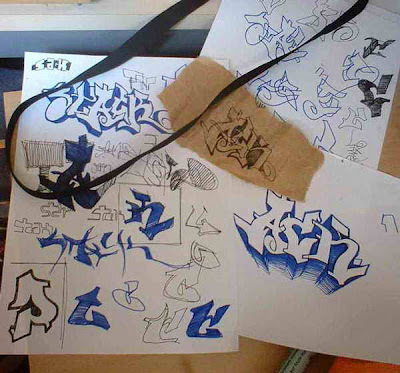 For those just getting started to plunge into the world of graffiti, it helps sharpen skills in the first sketchbook. Sketching is a very important both in preparation for making graffiti, as well as training activities. Piece is usually nicer if we depart from sketching. In the sketch, we can easily see the piece as a whole (different from the piece on the wall that requires us to move away from the wall to see it fully). Sketching it does not cost anything and can do in any situation, for example at the time of ride the bus, at a boring lecture hours, at home, anywhere. The most important thing is to always bring paper, pencil, eraser and sharpener wherever we are. Better yet if we have a sketchbook for drawing we can organized. Of course we can not forever stuck in the sketchbook, sooner or later we must plunge into the wall to see what we have poured the sketch.